Store your scooter in a shed or garage, if possible. If not, cover your scooter with a breathable cover. You don’t want to cover it with plastic which allows condensation. Get a cover designed for scooters or motorcycles which allows condensation to evaporate. Drain the gas. The gas in the carburetor can evaporate leaving deposits behind which can gum up the operation. At the very least you can drain the tank, then run the engine until it uses up the gas in the carburetor. There may still be some gas in the float bowl though, so drain the bowl if you can. You can use the gas in your car. Bring the battery indoors. They don’t like cold or standing without use and 3 months outdoors in freezing temperatures will likely kill it. Ideally, you should attach the battery to a “trickle charger”. This keeps the voltage up without putting a lot of current through the battery. 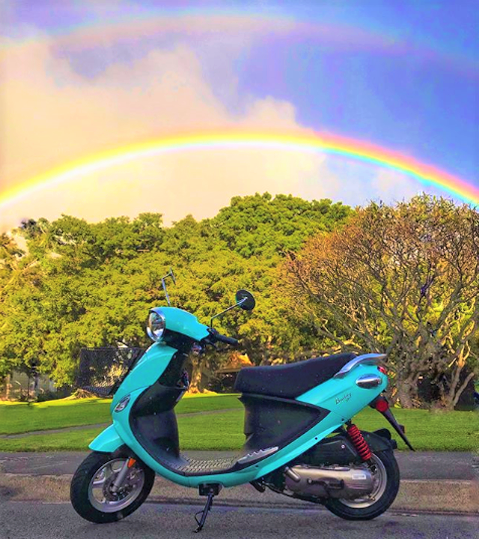 Make sure the scooter is properly tuned and running well before you store it. If it’s hard to start and doesn’t run well before you store it for a few months over the winter, it’s going to be even harder to get it running again in the spring. It’s better to do a tune-up before your store it. Do an oil change BEFORE you store the scooter. Oil picks up all sorts of corrosive contamination and leaving the engine cold and sitting in old oil isn’t a good idea. You could just drain the oil, but it’s safer to change it in case you forget to replace it in the spring. If possible, jack up the scooter so it’s not putting its full weight on the tires, to avoid “flat spotting”. Just using the center stand may be enough. Clean the scooter. Don’t leave corrosive deposits to do their worst over the winter. Clean off all the dirt and lubricate things like the brake linkages and throttle cable. If you have a scooter with a water cooled engine, make sure that you have enough anti-freeze in the cooling system to prevent freezing on the coldest days. Plug the exhaust pipe. Mice like to look for places to live in the winter, too. It’s not a good idea to just store the scooter and simply run the engine for short periods of time over the winter because if you don’t get everything hot enough, this may add moisture to the engine, exhaust, etc., which can then cause corrosion. If you could take it out for a 10 mile run once a week over the winter, you’d probably be OK (as long as you added stabilizer to the gas). But, starting it up in the garage for a few minutes may do more harm than good.